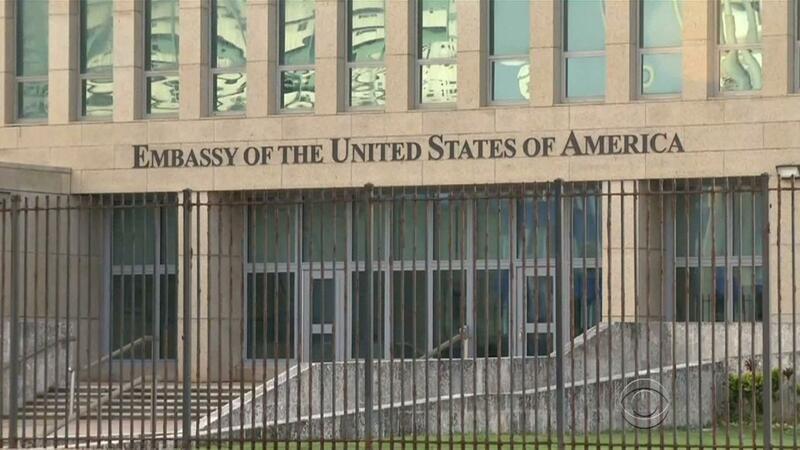 Doctors treating the U.S. Embassy victims of mysterious, invisible attacks in Cuba have discovered brain abnormalities as they search for clues to explain the hearing, vision, balance and memory damage, The Associated Press has learned. Physicians, FBI investigators and U.S. intelligence agencies have spent months trying to piece together the puzzle in Havana, where the U.S. says 24 U.S. government officials and spouses fell ill starting last year in homes and later in some hotels. The United States refers to "specific attacks" but says it doesn't know who's behind them. A few Canadian Embassy staffers also got sick. Doctors still don't know how victims ended up with the white matter changes, nor how exactly those changes might relate to their symptoms. U.S. officials wouldn't say whether the changes were found in all 24 patients. But acoustic waves have never been shown to alter the brain's white matter tracts, said Elisa Konofagou, a biomedical engineering professor at Columbia University who is not involved in the government's investigation. Cuba has adamantly denied involvement, and calls the Trump administration's claims that U.S. workers were attacked "deliberate lies." The new medical details may help the U.S. counter Havana's complaint that Washington hasn't presented any evidence. The case has plunged the U.S. medical community into uncharted territory. Physicians are treating the symptoms like a new, never-seen-before illness. After extensive testing and trial therapies, they're developing the first protocols to screen cases and identify the best treatments — even as the FBI investigation struggles to identify a culprit, method and motive. Doctors treating the victims wouldn't speak to the AP, yet their findings are expected to be discussed in an article being submitted to the Journal of the American Medical Association, U.S. officials said. Physicians at the University of Miami and the University of Pennsylvania who have treated the Cuba victims are writing it, with input from the State Department's medical unit and other government doctors. But the article won't speculate about what technology might have harmed the workers or who would have wanted to target Americans in Cuba. If investigators are any closer to solving those questions, their findings won't be made public. The AP first reported in August that U.S. workers reported sounds audible in parts of rooms but inaudible just a few feet away — unlike normal sound, which disperses in all directions. Doctors have now come up with a term for such incidents: "directional acoustic phenomena." Outside medical experts said that when the sample of patients is so small, it's difficult to establish cause and effect. "The thing you have to wonder anytime you see something on a scan: Is it due to the episode in question, or was it something pre-existing and unrelated to what happened?" said Dr. Gerard Gianoli, an ear and brain specialist in Louisiana. As Cuba works to limit damage to its reputation and economy, its government has produced TV specials and an online summit about its own investigation. Cuba's experts have concluded that the Americans' allegations are scientifically impossible. The Cubans have urged the U.S. to release information about what it's found. FBI investigators have spent months comparing cases to pinpoint what factors overlap. The U.S. has not identified any specific precautions it believes can mitigate the risk for diplomats in Havana, three officials said, although an attack hasn't been reported since late August. Since the Americans started falling ill last year, the State Department has adopted a new protocol for workers before they go to Cuba that includes bloodwork and other "baseline" tests. If they later show symptoms, doctors can retest and compare. Doctors still don't know the long-term medical consequences and expect that epidemiologists, who track disease patterns in populations, will monitor the 24 Americans for life. Consultations with the Centers for Disease Control and Prevention are underway.